If you’re looking for effective ways to killing mold with vinegar and hydrogen peroxide, then our detailed guide will walk you through on how to do it correctly. You have been hoping that this will be a night you won’t soon forget. After all, you have put a lot of effort into this evening. Maybe you are looking to entertain a bunch of guests for a gala dinner party at your home. Maybe you are looking to throw the party of the century. Maybe you are preparing to have that special someone over for a romantic night in and dinner for two. Maybe you are more professionally-minded, and are looking to conduct some vital negotiations at your place of business. Whatever the case may be, you need everything to be absolutely perfect. That’s a lot of pressure, but you’re up to it. You have spent weeks working to make this a perfect evening. You have spent your time preparing the decorations, ordering professional catering, maybe whipping up a thing or two on your own, and generally making sure that your space is as pristine as possible. It was a lot of hard work, but as your guests start to file in, thoroughly impressed, you can clearly see that it was all worth it. Someone wrinkles their nose and asks what that unsavory-looking black spot is. Maybe that spot is located up on your ceiling. Maybe it’s present in the shower. Maybe it’s attached to the walls. To your horror, it might well be all three at once. Wherever it is, you know what it is all too readily – mold. Just like that, this has become an evening you won’t soon forget – but for all of the wrong reasons. A mold infestation can wreak havoc on your life, as well as your property. Inhaling mold can be extremely dangerous, and its very presence is odious and extremely unpleasant. What is more, mold can, if left unchecked, be a deathblow for your property’s viability and value. Mold infestations are a common problem for home and business owners. In particular, homeowners like to try and take matters into their own hands when it comes to mold removal. 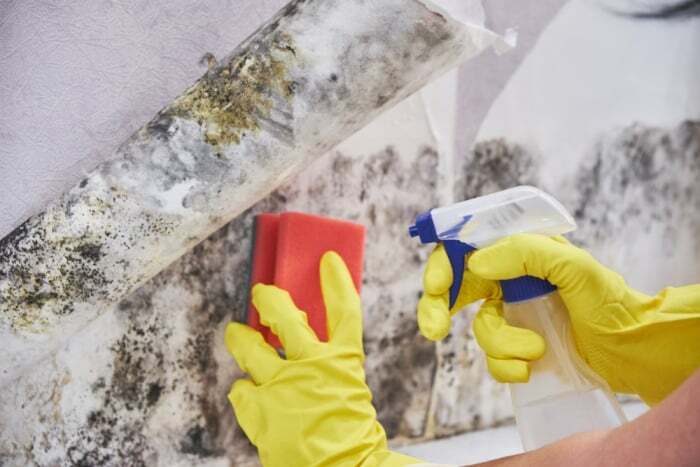 While larger infestations should ideally be dealt with by a team of trained professionals, if you “only” have a tiny outbreak on your hands, there are several home remedies you can employ to nip your mold problem in the bud. Here are just a few such approaches you can take to remove mold on your own via vinegar, hydrogen peroxide, and other household items. Why Is Cleaning Mold With Bleach A Bad Idea? Let’s first look at how we can clean up mold with another common household item – bleach. This will be useful for comparing the effectiveness of our vinegar and hydrogen peroxide approaches later on. That said, if you’re thinking “Why not simply mix the vinegar and bleach together, for double the mold-killing power,” don’t do that. Mixing the two together can create chlorine gas, and given that that’s the kind of thing that can get you in trouble in a war crimes court, it really isn’t the sort of thing you should be employing against mold spores, no matter how pernicious. This is, incidentally, one reason why so many people do prefer working with vinegar by comparison – the lower levels of danger and toxicity involved. Using bleach to kill mold typically involves pouring a small quantity (one cup of bleach per one gallon of water with which you mix and dilute it) and then applying this to the surfaces in question. How well does bleach fare against mold? Honestly, not very well. The bleach is not typically able to penetrate certain areas, such as wood, and so cannot effectively treat many surfaces affected by a mold outbreak. Add to that the potential for a slipup to lead to your permanently staining your home, and it should come as no surprise that vinegar and hydrogen peroxide are both far more well thought of as removal remedies. Now that we’ve established why something such as bleach is a generally bad idea for mold removal, let’s turn our attention back to vinegar. Like bleach, vinegar is a darling among the Do It Yourself home care crowd. It is something just about everyone owns and can easily be obtained. For our purposes, “vinegar” here refers to the type of white distilled vinegar you can typically get at the store. So, how can you go about cleaning up mold with your Friendly Neighborhood Bottle of Vinegar? To begin with, you’ll want to pour a certain amount of vinegar into a spray bottle. Since you are using a spray bottle to control the amount of vinegar used at a time, you don’t need to worry about how much is present. You’ll, thus, be able to spray the surface with your vinegar as much as needed. Be careful not to spray it so much that the spray starts to have an adverse effect on the surface itself. That being said, you also want to be sure that you are spraying enough to where there is an actual effect. While vinegar is certainly a safer overall option than bleach, there is no question that the latter is far stronger. As such, you are probably going to have to use more vinegar than you would bleach to get the job done. That being said, the safety factor and aforementioned ineffectiveness of bleach on certain substances still makes vinegar the superior choice in this regard. After you have sprayed the surface in question, you will want to gently dab it and wipe it down with a rag. You’ll then want to wait about another 10 to 15 minutes and repeat the process. In between the spraying and dabbing, you’ll also want to have something on hand with which to scrape up and remove the mold in question if possible. That said, you want to make sure that this tool (whatever it may be for you) is not so abrasive as to damage the surface you are spraying and dabbing. Remember, one of the core reasons for using vinegar over other methods is the relative safety it provides with respect to preserving wooden finishes in particular. Next, let’s turn our attention to cleaning up a moldy mess with hydrogen peroxide. For this, you’ll need both a bottle itself, as well as something with which to scrub the area in question. In terms of the amount you should be using, a 3% concentration of hydrogen peroxide should suffice, though for really stubborn mold you may need to go as high as 10%. From there, it is as simple and straightforward as was the vinegar – pour out a bit of hydrogen peroxide, dab it onto a cloth, apply it to the affected area, and then use something to scrub up the moldy remnants. There are many advantages to working with a vinegar mix. For one thing, as stated, vinegar is extremely easy to find. For another, vinegar is an all-natural cleaning agent. If you are into the “all-natural lifestyle” kick that is so popular nowadays, this is probably your preferred cleaning material overall, and it does its job well here. The natural acidity of vinegar makes it an ideal candidate for breaking down and, thus, helping to clear away pollutants, and the same holds true when it comes to how it treats mold. The downside? Aside from that classic vinegar smell that accompanies its use, vinegar is not as strong as other cleaning products. That said, as demonstrated with the bleach, stronger is not always better, and vinegar is certainly more than up to the task of handling most mild to moderate mold outbreaks. How about hydrogen peroxide? It, too, is a pretty viable alternative in this respect. It is highly useful when it comes to cleaning up slightly more stubborn mold patches than might be assailable with vinegar. What is more, hydrogen peroxide, while nowhere near as common as vinegar, still isn’t too hard to find. In addition, hydrogen peroxide is an antibacterial agent, which is one reason you’ll typically see it used in hospitals. As such, if you want to make sure that you kill any bacterial agents along with the mold you’re treating, hydrogen peroxide can be a fantastic way to kill two birds with one stone. The disadvantage? Mainly that it, again, is not as strong as bleach, and is slightly less available than vinegar. That being said, the advantages of hydrogen peroxide and vinegar over bleach in this respect have already been enumerated. It’s worth noting that while vinegar and hydrogen peroxide are great solo artists when it comes to tackling mold problems, combined in the same container, they have serious chemistry problems – namely that they form a corrosive acid. So, as with the vinegar/bleach mixture, that is something that you need to avoid. That being said, there is no denying that, on their own, both vinegar, as well as hydrogen peroxide, serve as two of the most effective ways to clean up mold in a quick and effective fashion.